Hi everyone! 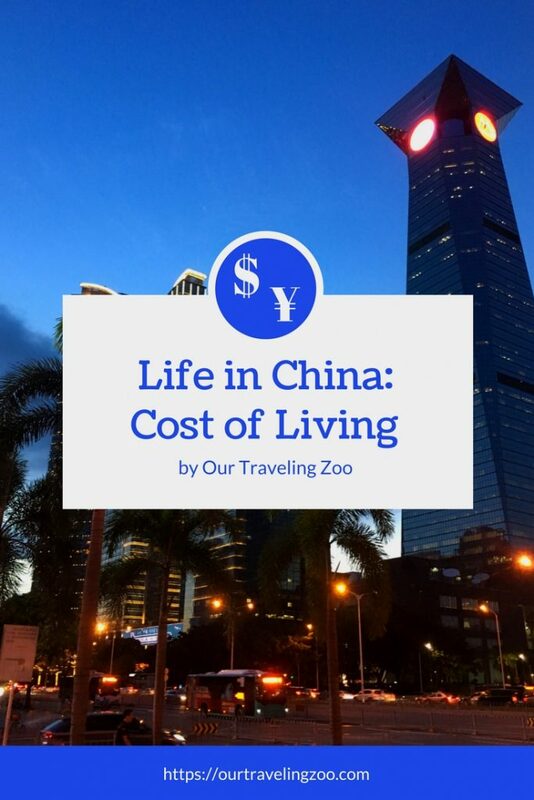 Welcome back to “Life in China.” This is the second post in our series, and it is all about cost of living here in Shenzhen, China. We are frequently asked what the cost of living in China is like and whether we can save any money. These are really good questions, because while China has a famously low cost of living, Shenzhen rates among the most expensive cities in the country. Here is our personal experience with cost of living in Shenzhen in 2018. Prices are in Chinese Renminbi (RMB), which is also known as yuan, and referred to as “quai” in the local vernacular. At the time of writing, $1 is equal to 6.3 RMB. First, let’s get something straight: Shenzhen is big. It covers 760 square miles, more than double that of New York City. Shenzhen has eight districts and a ton of sub-districts. Some of them are fancier than others, and like anywhere else, fancy areas tend to be more expensive. We live in Nanshan (which consists of eight sub-districts), and prices are noticeably more affordable in our sub-district of Taoyuancun than swankier sub-district Shekou, which is where people around here head when they’re looking for a more Western experience. In Shekou, there is more English spoken, it is cleaner, and the restaurants and bars cater to expats. Our sub-district is much more Chinese. My employer provides either a monthly allowance toward rent, or the option to live in provided housing. We chose to live in the supplied housing, and it’s clean, new, and, tiny kitchen aside, reasonably sized; the allowance also wasn’t enough to cover a nice place. If your employer doesn’t provide housing for you, you’ll need to rent an apartment. Bearing in mind that prices vary, a quick browse of classifieds on Shenzhen Party shows prices for a 2BR apartment ranging from 6,500 to 13,500RMB monthly. My coworker Chris rented a 2BR flat near the school where we work, but he decided to move into the provided housing to keep expenses down. He paid 7200 a month for his apartment, and he says he was shown places of similar size for as low as 5,000, but they were old and small. We have friends who pay 7500 for their 2 BR just down the road, exclusive of utilities. Other friends pay 9500 for their 3 BR more or less in the heart of Nanshan. If you are shopping for a place, it’s a good idea to get in touch with an agent to help you find a rental property. We’ve been repeatedly told that photos online have little to do with the actual apartments so it is not a good idea to agree to something without seeing it in person first. Besides rent, the next most important factor in cost of living is food. Since we have a fridge about half the size of a typical one back in the USA, we buy groceries in much smaller batches. This is easy as there are lots of small mom and pop shops selling fruits and veggies. There is a Shirble nearby, too, similar to a WalMart. As always, it pays to watch for sales: I bought 2+ pounds of apples (which tend to cost a lot) last week for 7RMB (a bit over a dollar). Typically, 100RMB gets us a week’s worth of fruit, which usually includes bananas, dragon fruit, and Asian pears, but sometimes also apples, oranges, or other fare. Rice is cheap, as you’d expect, and veggies are affordable. We purchase homemade yogurt in little plastic containers (200ml, maybe?) for 5RMB each. Usually 5 cartons last us a week. Getting decent Western fare can be both difficult and expensive. Despite bakeries proliferating like crazy, it is hard to get a decent loaf of whole wheat anywhere. It is easy to find fluffy white bread with red beans–a very Chinese bread indeed. Milk and cheese can get quite expensive (think 35-45RMB for 8oz of Cheddar). We usually shop for pasta, canned tomatoes/passata, cheese, and butter at Metro, a German supermarket similar to Sam’s Club. Jenia goes there biweekly and spends 600-900RMB. Bear in mind that we are budget conscious. Lots of folks we know use the delivery service called NoGoGo to deliver western foods. That is costly but convenient. You can buy cheap, tasty street food here. We sometimes get a lunch of a noodle dish for 10RMB. There is a Chinese barbecue joint eight minutes walk away, and the whole family can eat a hearty meal for about 60RMB. I frequently get lunch at a small Korean restaurant–my favorite dish costs me 25RMB. Sometimes I eat at a Muslim noodle joint close to my school, where they knead and hand-pull the noodles right in front of me, and I am stuffed for a mere 15RMB. None of this is fine dining, but it’s affordable and reasonably healthy. There are plenty of fancier restaurants. For example, we ate at a white linen Buddhist (i.e. vegetarian) restaurant in OCT Harbour and spent 200RMB on dinner for us four. Not at all exorbitant, but getting pricier. The other day we ate lunch with friends at their favorite Chinese restaurant in Coastal City, and the tab for four adults and three little ones was almost 500RMB. Everything depends on where you go and what you order. You can go to Starbucks and spend the same (ridiculous) amount of money you would in the USA. All told, it’s possible to eat cheaply if you wish. H&M is here; Uniqlo is here; big designer brands and little ones we’ve never heard of are here. Prices are comparable to what we’d pay in the USA. Then there’s Taobao – a sort of a Chinese Amazon.com – where one can find some amazing deals. Jenia bought a couple of things for herself and several for the kids paying no more than 30RMB per kid’s item. In fact, there’s a whole online children’s clothing store in the US that seems to import every single item from Taobao. Like many other things here, there are options. 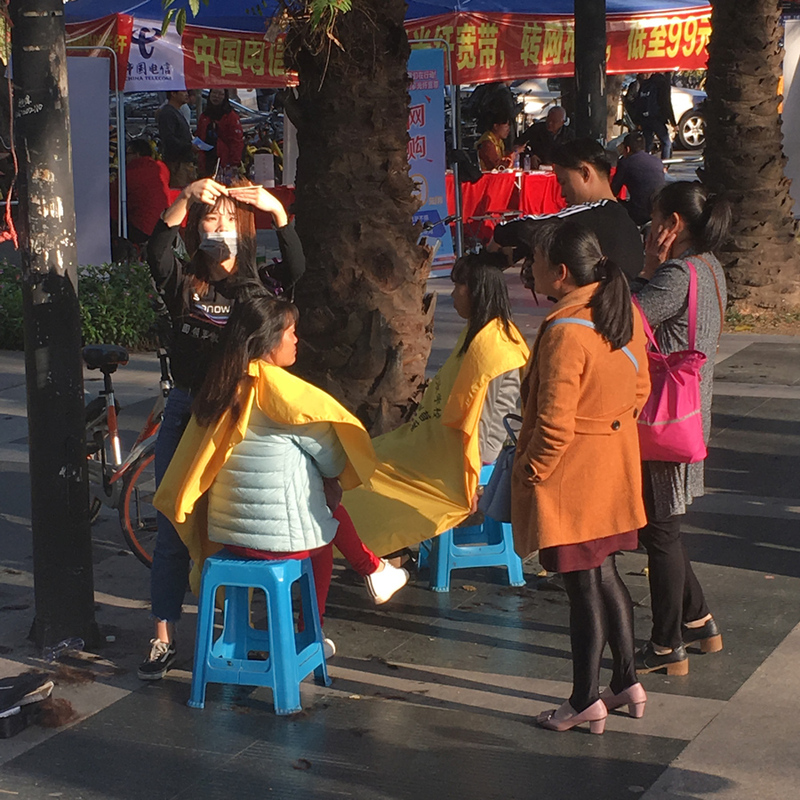 You can pay 10RMB to one of the people who cut hair in the streets (Shon’s done it!) or go to a salon where at least someone speaks English and pay up to 380RMB (that’s the highest price for a cut we’ve seen so far). We went to see Black Panther in March. 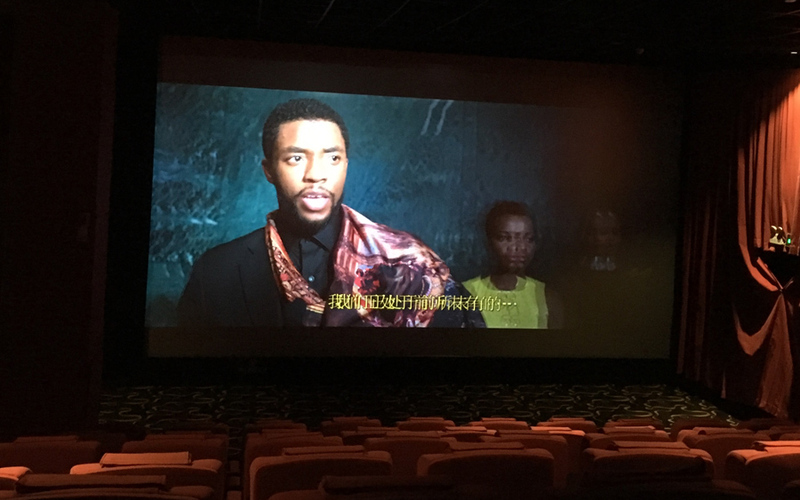 We paid 70 RMB for 2 people at the local theater; that was for a feature in 3D with English subtitles (most American films are shown with subtitles, not dubbing). It is possible to go to a big IMAX theater (for example at OCT Harbor) and pay that much money per ticket. Taxis are ubiquitous. They start at 10RMB and go up per kilometer; we usually pay around 35RMB for a 20 minute ride. Prices are similar for rides hailed on Didi, the uber-handy service which actually bought out Uber in China. Buses usually cost 1.60-2.50 per ride. Metro varies on length of ride, but a typical 20-30 minute ride is generally around 3-5 RMB. It is a little more expensive if you pay per ride so we prefer to use our metro/bus card. In closing, cost of living in Shenzhen is very much what you make it. The city is so large and the opportunities for spending so varied that you can live the high life and drain your wallet speedily, or you can be budget conscious and live quite easily for much less than you would in the USA. Rent is likely to be a considerable expense unless it is covered by your employer. We choose to adapt our eating habits to fit the available cuisine and keep things affordable. We use public transportation more than taxis, and we spend less weekly than we did filling up the Volvo’s gas tank once a week back in Salt Lake City. As for clothing, it is typically no more expensive than back home. We are budget conscious, and as a result, we are able to save money, even on one income. There you have it. Stay tuned for our next installment, in which we talk about our favorite things to eat in Shenzhen. Head over to Life in China: a Series to read all of our posts about expat living in China. For a complete step-by-step of what it takes for an American teacher to obtain a China work visa, click here. i went there, and cost of visiting depend on actually you that how much happiness you want. By the way you post was amazing and very helpful for new person who want to visit china first time. Yes, it’s like anywhere else–luxury will cost you! I’m glad the post is helpful. Did you have a pleasant experience in China? You are making a lot of assumptions and aren’t reading attentively, I’m afraid. All of our produce comes from markets/little mom-and-pop shops in our neighborhood. The photo from Ole was only to demonstrate how ridiculously expensive Western food can be. We make our own peanut butter and, a lot of the time, our own bread, too. Would be thrilled to hear your advice on a really good bakery in town that makes seriously good whole wheat sandwich bread and delivers to remote parts of town. 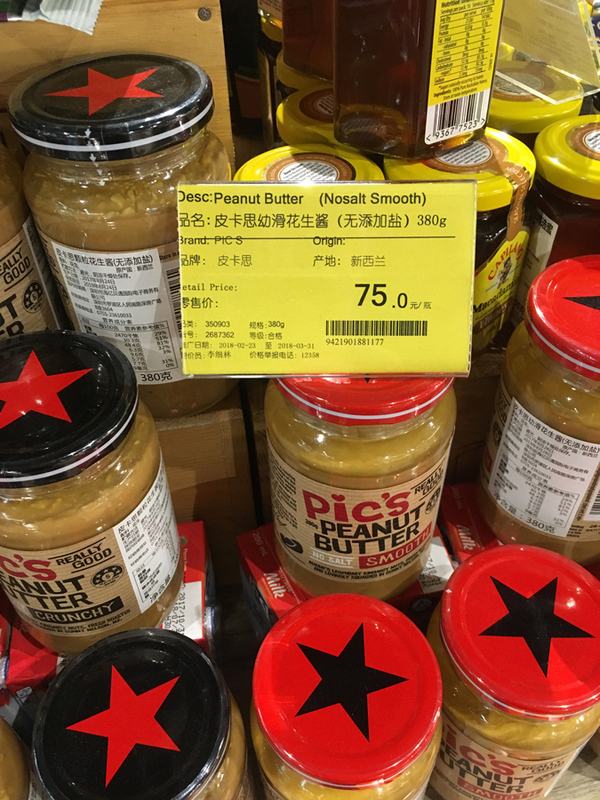 As for Dianping, this isn’t a post on how to pinch pennies in Shenzhen but about the cost of living for an average family of 4 in their first year here.